During the centennial celebration of Frank Sinatra, his career and life will be celebrated worldwide. Frank was born in Hoboken, New Jersey, on December 12th, 1915, and lived in many different places during his 83 years of life. He passed away on May 14th, 1998. If Frank were alive today, it is unlikely that he would call Miami Beach home, but it is likely that he would admit to having very fond memories of his time there. Starting in the 1950s, and continuing for a good 20 years, Sinatra visited Miami Beach frequently for both work and play. 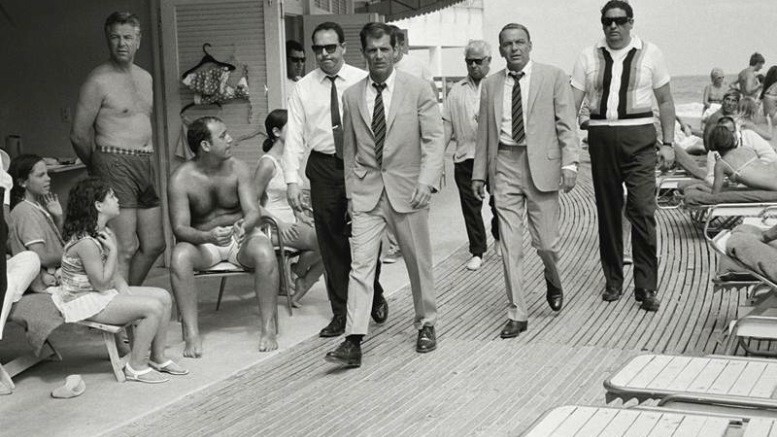 Frank Sinatra and his pals were regular visitors to Miami Beach. 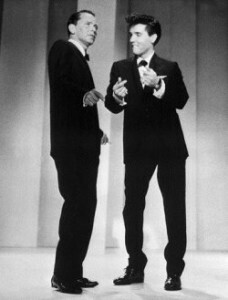 The Rat Pack consisted of Dean Martin, Jerry Lewis, Peter Lawford, Joey Bishop and Sammy Davis Jr. as well as Frank. Sinatra was the pack’s leader, which may have contributed to his nickname the “Chairman of the Board”. During his life, Sinatra was known to have several nicknames. By the end of 1952, Frank Sinatra was considered to be in a career slump. His relationship with his recording studio, Columbia, had disintegrated. However, by the summer of 1953, the movie, From Here to Eternity, which he had a starring role, began a revival of his career. Sinatra had also signed a new contract with a different recording studio, Capitol Records, and both his spirits and career were improving greatly. It was around the time of his career revival that the Fountainbleau Hotel would open. The hotel was built by Ben Novack and it ushered an era of extravagantly designed hotels being built on Miami Beach. The grandeur and opulence of the hotel resonated with Sinatra. The hotel was designed by Morris Lapidus and opened in 1954. 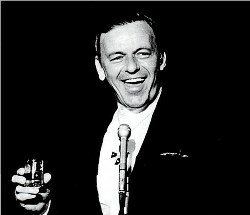 Frank Sinatra performed at the LaRonde Supper Club in the Fontainebleau on many occasions. When he was not performing, he would travel to Miami Beach on vacation and chose the Fontainebleau as his hotel of choice. It was during this timeframe that Frank could be found holding court in the lobby bar of his favorite Miami Beach hotel to all hours of the morning. According to an excerpt from the book “Miami Beach Memories”, Sinatra and his pals would be seen around town in $1000 custom suits, surrounded by body guards. They were considered “hotshots around town”. On occasion, Sinatra would get into a fight that he would normally let his bodyguards finish. It was at the Fontainebleau that Sinatra performed a duet with Elvis Presley on March 26th, 1960 as part of the Frank Sinatra Timex Welcome Home Elvis show. The showed aired on television on May 8th. Despite Sinatra’s negative feelings about Rock & Roll, his daughter convinced him it would be good for his show to honor Elvis Presley’s return home from his military service. To see a video on the Fontainebleau and part of that performance, click here. Throughout his career, Frank Sinatra was not only an elite musical talent, but he was also an accomplished actor. Three movies that were filmed on location around Miami and Miami Beach were: A Hole in the Head, Tony Rome and The Lady in Cement. In the summer of 1959, Sinatra starred in the movie “A Hole in the Head” which was filmed primarily in Miami Beach. The plot of the movie featured Frank Sinatra’s character, Tony Manetta, as a down on his luck hotel operator trying to stay in business. The opening credit scene features a spectacular aerial shot over Miami Beach during the late 1950s. The movie was primarily filmed at the Cardoz0 Hotel located at 13th and Ocean Drive. There were other locations used in the film, but the Cardozo Hotel was the featured location. It was later owned by Andrew Capitman, son of Barbara Capitman, both of whom were instrumental in preserving the Art Deco district. 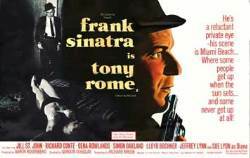 In the fall of 1967, Frank Sinatra filmed the movie “Tony Rome” in a number of locations around Miami and Miami Beach. The plot of this movie featured Sinatra as a Miami private investigator who lived on a houseboat. Sinatra’s character is hired by a local millionaire to find jewelry that was stolen from his daughter, and ends up having confrontations with local mobsters and the Miami Beach police. According to Internet Movie Database (IMDB), some of the South Florida locations featured in the film include the Fontainebleau Hotel, Mount Sinai Hospital, the Sheraton Four Ambassadors on Brickell Bay Drive, and the Wreckbar at the Castaways Hotel in North Miami. The Four Ambassadors was being built at the time of the filming and the movie featured the construction site in one scene. In the following year, the sequel to “Tony Rome” was filmed in Miami Beach. The name of the movie was “The Lady in Cement”. Once again, the film featured Sinatra as Tony Rome, private investigator, hired to solve a murder mystery in Miami Beach. According to IMDB, in addition to being filmed on location in Miami Beach, the movie also shot a scene at Jilly’s Night Club in North Bay Village. It also featured a scene on Biscayne Boulevard in Miami. During the Sinatra centennial, the Fontainebleau will honor Sinatra’s past in their iconic Miami Beach Hotel. The hotel will feature a photograph exhibit highlighting Sinatra’s time at the hotel and around Miami Beach. There is also an exhibit that will open at HistoryMiami in February of 2016. The exhibit will feature photographs, posters and other memorabilia about Sinatra’s time in South Florida. One artifact that will be offered in the exhibit is a poster that advertised the movie Tony Rome. The tagline on the poster reads: “His scene is Miami Beach, where everyone gets up as soon as the sun sets”. The tagline describes perfectly why “America’s Playground” appealed so much to Frank Sinatra. Not to take anything away from Chicago or New York, but Miami Beach was his kind of town. 4 Comments on "Frank Sinatra in Miami Beach"
Hi! The hotel that was used in “A Hole in the Head” was The Cardozo. Designed by Henry Hohauser, it was named for Supreme Court Justice Benjamin Cardozo. The Castaways Hotel was in North Miami Beach.